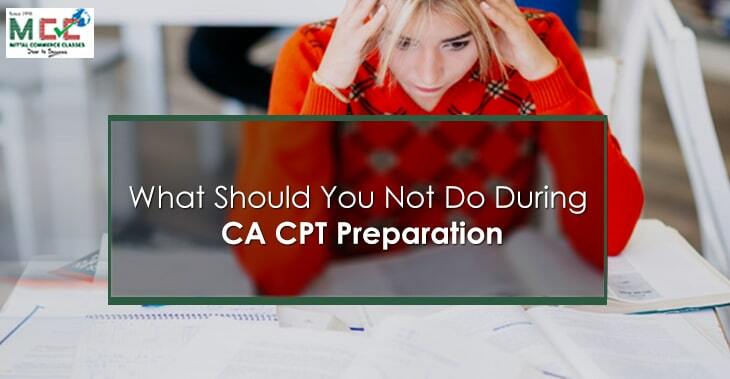 How to prepare for CPT Exams for June 2019 (what you should not do)? This article motive is not to lecture you on how you should study for a specific subject or how important it is to keep yourself focused and healthy or how to manage your time, instead, I would like you to know what you should not be doing to make this exam plain and smooth sailing. Before we move ahead, let us touch on important details of CPT exams. From June 2017 students are eligible to register only for CA Foundation level earlier known as CPT after appearing for 12th STD. CPT exams are held twice in a year in June and December but this year, exams held in June which will be the last attempt to clear CPT exam. CPT has four objective type paper for a total of 200 marks. CPT exams are held only in 1 day in 2 shifts from morning to evening. Every question carries 1 marks and also levy negative marking of ¼ mark on wrong answers. Now, after understanding the pattern and syllabus of the exam, It is important to understand how to prepare for CPT exams. We assume you must have registered for the CPT course, when you were in 10th STD and are appearing for your CPT test in June 2019, after appearing for your 12th STD exams. If you opted for commerce stream in your 11th STD, then, you might have inherited the basic knowledge about accountancy and economics in your school syllabus. But if you are from science or arts background you might have prepared yourself for CPT exams, along with your school study., through your coaching classes. A fresh mind is reckless while making a decision. The zestful youth need to understand the importance of 12th examination and commitment required for both tests. It is important to know what is your previous academic record and your willingness towards the professional course and then accordingly you should register for the course. Please don’t fill any registration form only because of your friends, or neighbors are doing that. The course of CPT is easy and objective. Until and unless you are not interested and inclined to the course it will be “a mountain to move” for you. We understand that the teenager’s mind stirs every second. We won’t demotivate your intriguing nature, but what we want from you regarding CPT exams is to be observant towards syllabus, updations, pattern and CPT study material available on our website. The regular engrossment will keep you on track and you will be shielded towards unexpected and unnecessary hassles. “Failing to plan is planning to fail”: if you want to succeed in your CPT exams you have to be realistic and religious to your time table. If you have analyzed your abilities and weakness and schedule your study time accordingly, then try it for a few days and observe whether you are able to move accordingly, or you need to tweak your calendar and make it more realistic so that you can follow it religiously and reach your goal. The CA CPT mock test paper, RTP, CA CPT sample papers is the most effective way of preparing for exams. You can’t miss on these and pave your way to CPT June 2019 exams. CPT exams are not that hard if you understand the concept. The thorough understanding of the concept and continuous practice is sure to key to success. Please feel free to ask your query regarding CPT exams in the comment box below. Keep yourself healthy and zestful.